PayPal Holdings, Inc. is one of the largest online payments companies that allow parties to make payments through online funds transfers. The company’s online payment system offers electronic alternatives to traditional payment methods such as money order and checksCash EquivalentsCash and cash equivalents are the most liquid of all assets on the balance sheet. Cash equivalents include money market securities, Bankers Acceptances, Treasury bills, commercial paper, and other money market instruments.. The company provides a platform for online vendors, auction sitesAuctionAn auction is a system of buying and selling goods or services by offering them for bidding, allowing people to bid, and selling to the highest bidder. The bidders compete against each other, with each subsequent bid being higher than the previous bid. Once an item is placed for sale, the auctioneer, and e-commerce users to make secure payments anywhere in the world, charging a fee for each transaction on its platform. Online shoppers are not required to disclose their credit card or bank account numbers when making transactions, making PayPal one of the safest payment processors in the world. For customers to use the PayPal online payment system, they need to open an account on the company’s website. The account is then connected to the user’s credit card or checking account to enable payment. However, for the account to be fully operational, the user must provide proof of funds and identification documents. Once the account is confirmed and verified, the user can start sending and receiving payments to and from other accounts. Users can also use their account to make payments on e-commerce sites such as eBay and Amazon. PayPal was established in 1998 as Confinity, a company that developed security software for handheld devices. Its founders were Max Levchin, Luke Nosek, Peter Thiel, and Ken Howery. The company later transitioned into a money transfer service in 1999, with funding support from John Malloy. 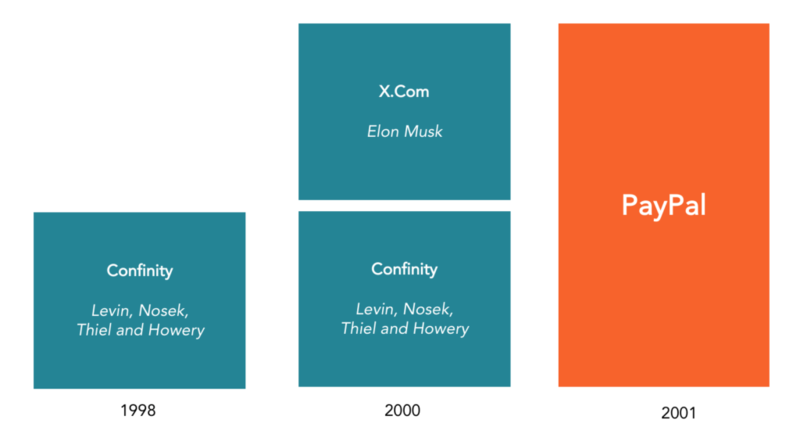 Confinity later merged with X.com, which was founded by Elon Musk, in March 2000. X-com offered internet banking services, but the founder decided to terminate the services and focus on Confinity’s money transfer service. In 2001, X.com was renamed PayPal, and the owners decided to go public through an initial public offeringInitial Public Offering (IPO)An Initial Public Offering (IPO) is the first sale of stocks issued by a company to the public. Prior to an IPO, a company is considered a private company, usually with a small number of investors (founders, friends, families, and business investors such as venture capitalists or angel investors). Learn what an IPO is in 2002. The IPO was issued at $13 per share, and the company generated $61 million. PayPal gained popularity as an online payments processor during the Initial Public Offering (IPO)Initial Public Offering (IPO)An Initial Public Offering (IPO) is the first sale of stocks issued by a company to the public. Prior to an IPO, a company is considered a private company, usually with a small number of investors (founders, friends, families, and business investors such as venture capitalists or angel investors). Learn what an IPO is, and eBay decided to acquire it later that year for $1.5 billion, with a valuationValuation MethodsWhen valuing a company as a going concern there are three main valuation methods used: DCF analysis, comparable companies, and precedent transactions. These methods of valuation are used in investment banking, equity research, private equity, corporate development, mergers & acquisitions, leveraged buyouts and finance of over $23 per share. As a wholly-owned subsidiary of eBay, the company became the official payments transfer service for the eBay website. One in every four closed auction listings accepted PayPal as a payment method, and more than 70% of all eBay auctions accepted PayPal. In 2010, the online payments platform listed over 100 million users in 190 markets and 25 different currencies. Later in 2011, the company announced that it would begin moving its business offline to allow its millions of customers to use PayPal in physical stores. It entered into a partnership with Discover Card in 2012, allowing its users to make PayPal payments in any of the seven million stores that support Discover Card network. On September 30, 2014, eBay announced that it would spin off PayPal into a separate entity. The change would allow PayPal to trade publicly as an independent entity. The spin-off was completed in July 2015. Dan Schulman became president and CEO of the new company while former eBay CEO John Donahoe became the chairman. Since its inception, PayPal’s made several acquisitionsMergers Acquisitions M&A ProcessThis guide takes you through all the steps in the M&A process. Learn how mergers and acquisitions and deals are completed. In this guide, we'll outline the acquisition process from start to finish, the various types of acquirers (strategic vs. financial buys), the importance of synergies, and transaction costs of other companies in the electronic payments, digital money transfer, and financial transaction industries. The new acquisitions not only attracted new customers to PayPal but also brought better technologies that enhanced the online payments company’s operations. In 2005, PayPal acquired payment solution company VeriSign to expand its e-commerce business. The acquisition was worth around $370 million, for a business that handled $40 billion in online payments in 2004. Through the deal, VeriSign would provide PayPal with security support services through the purchase of two million tokens. Tokens are key-chain sized USB plugins that are used to create a two-factor security that protects users from online theft and other online security issues. The tokens require users to provide a security password as well as the physical token in the case of merchants. PayPal acquired Fraud Sciences in January 2008 to enhance its fraud management systems. Fraud Sciences is a privately held Israeli fraud detection provider that offers automated anti-fraud systems such as SpotLight VFX and SpotLight T2T. The fraud detection tools help PayPal and eBay to verify the identity of buyers and accept transactions from buyers that would be mismarked as suspicious. The company was acquired for $169 million. The online payments company also purchased Bill Me Later, a proprietary payment method firm that offers transactional credit to over 9,000 electronic merchants in the US. It offers consumers a line of revolving credit through its partner, Comenity Capital Bank. The service allows its customers to make purchases on online retail sites without using a credit card. Bill Me Later, now rebranded as PayPal Credit, is available on leading merchant websites such as Wal-Mart, Best Buy, Overstock, Hotels.com, Home Depot, and JetBlue Airways. The acquisition was completed for $945 million in October 2008. The internal developments and acquisitions of smaller companies allow PayPal to provide diverse services to its users. Through the online payments platform, users can transfer funds electronically either through personal and business accounts. Personal accounts allow individual users to make financial transactions online and send or receive funds to and from other users. The PayPal Business account allows businesses to receive payments from customers and make payments for goods purchased both online and in physical stores. The online payments platform supports 25 different currencies and users can change from one currency to another from the account’s dashboard. Online retail stores include PayPal as one of the accepted payment methods. Users can make secure payments easily and receive discounts and cash back in selected stores with such arrangements with the online payments company. It also offers its own branded credit. Customers approved for this credit are given MasterCard credit cards. They may also acquire PayPal debit cards as well as prepaid cards. Days Payable OutstandingDays Payable OutstandingDays payable outstanding (DPO) refers to the average number of days it takes a company to pay back its accounts payable. Therefore, days payable outstanding measures how well a company is managing its accounts payable. A DPO of 20 means that on average, it takes a company 20 days to pay back its suppliers. Financial Analyst Certification ProgramFMVA™ CertificationThe Financial Modeling & Valueation Analyst (FMVA)™ accreditation is a global standard for financial analysts that covers finance, accounting, financial modeling, valuation, budgeting, forecasting, presentations, and strategy.